Terminator 2: Judgment Day (Ｔ２ジャッジメントディ) is a Sega Master System and Sega Game Gear game adaption of the 1991 film of the same name. It is unrelated to the Mega Drive game of the same name as this game is a port of the 1992 NES game released by Acclaim's LJN subsidiary. The game is infamous for painful music and bland graphics. 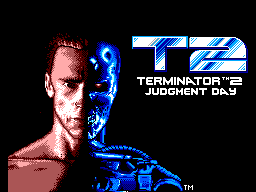 It is a platform game, in which you control the terminator through the events of the movie. shoots/punches and jumps. The Terminator goes to the truck stop and the tavern. Defeat everyone in the area. The second stage has you going around in the Pescadero State Hospital to rescue Sarah Connor. The third stage is Cyberdyne, where your goal is to blow the place up. The fourth stage is in the Steel Mill, where you jump on platforms and eventually confront the T-1000. Main article: Terminator 2: Judgment Day (8-bit)/Magazine articles.